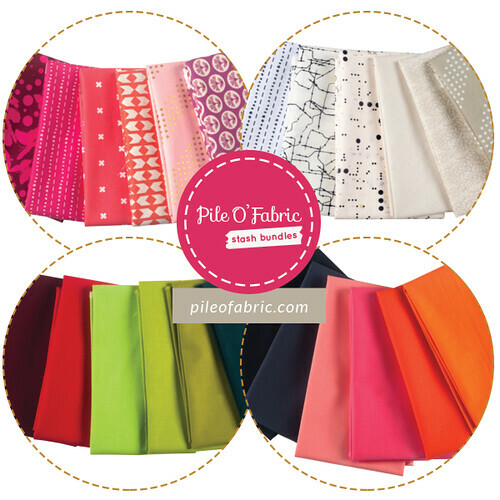 I have a fun giveaway for you today sponsored by Pile O' Fabric! Details for entering are at the bottom of this post. Pile O' Fabric started as a modern quilting blog by Alyssa Lichner with tutorials and project inspiration. Alyssa is a great resource for skill-building and helpful tutorials. This year, Pile O' Fabric branched out, and it is now an online fabric, supply, and pattern shop. Note: Alyssa offers free domestic shipping on all orders over $45, a rewards program for returning customers, and all fabric is labeled with the designer, collection, name, etc. Woohoo! Alyssa always puts together fantastic stash bundles for us. 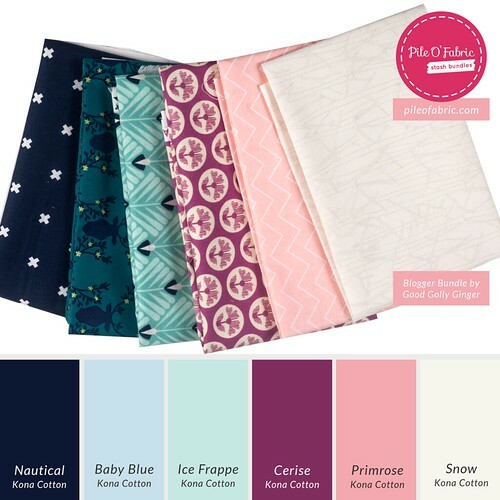 This last week, I was able to help out, and I put together the Frozen Bundle of coordinating prints and Kona Cotton solids. The prints include XOXO in Night Ow, Trophy in Teal, Deco Petal in Turquoise, Sealing Wax in Amethyst, Zig Zig in Shell, and Branches in Ash. The solids include Kona Cotton in Nautical, Baby Blue, Ice Frappe, Cerise, Primrose, and Snow. I made a new (and free!) 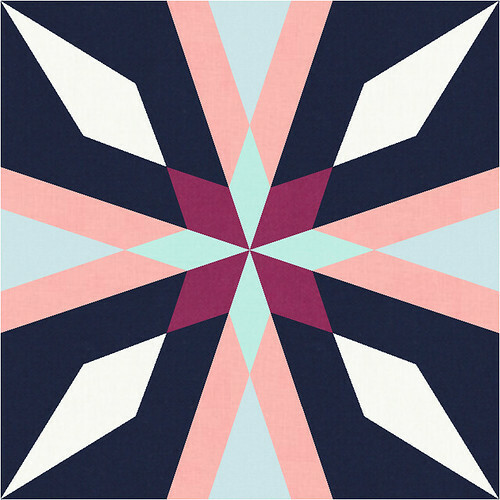 foundation paper pieced pattern that will coordinate beautifully with these fabrics. The pattern can be downloaded from my Craftsy Pattern Shop. This pattern will be free through the holidays. So go get it! Enter to win the Frozen Bundle in the prints AND solids!!! That’s 4 possible entries! Enter now through Monday, December 8! 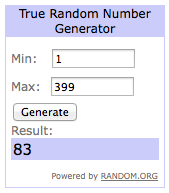 The winner will be picked at random, and I will announce the winner at the bottom of this post. Note: This giveaway is open to EVERYONE! If you're a "no reply" or anonymous commenter, please remember to include your email address in your comment! Thank you!!! 2nd Note: There will be another giveaway on Monday, December 8, for the Sew Mama Sew Giveaway Day! Let the giving continue!!! I subscribe to the Pile O' Fabric newsletter. I love your frozen star pattern - the blocks look so amazing when put together, especially in this color palette! I follow your blog via Feedly. Thanks very much for the fun giveaway! I subscribe to the Pile O Fabric newsletter. I enjoy reading your blog and thanks for the opportunity to participate in the giveaway. I follow Alyssa on facebook! I follow you via email! Optional second comment! I love the new computer programs for turning pictures into quilt blocks, as well. Way cool! Looks like my first comment disappeared. 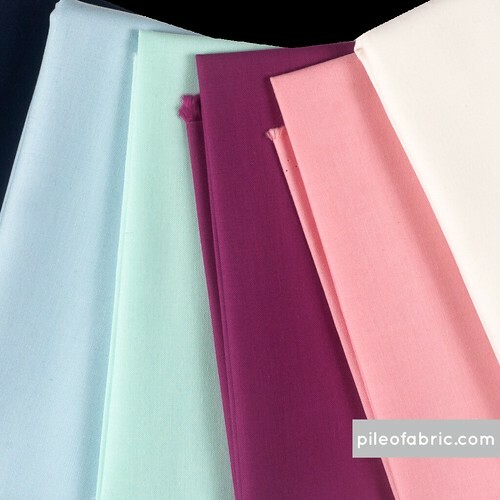 I subscribe to Pile o' Fabric, that's how I found your blog! :) I've been quilting fit over 20 years, love the new fabrics and patterns. I already receive the Pile'o'Fabric newsletter. I love the frozen bundle and have 3 granddaughters who love all things frozen. Comment number three, following on Facebook and instagram! I am subscribed to the newsletter, which I always look forward to , follow on facebook, bloglovin and I am getting the pattern now, thanks for the giveaway, oh and I love your blog. I love the paper pieced pattern, I've got to try paper piecing someday! Love this color combo. Never would have picked it myself, but it's awesome. This new pattern is beautiful and I love the color choice. I follow you with bloglovin. lv2bquilting2@comcast.net and thanks for the giveaway opportunity. The Frozen colors would be perfect for a couple of our great granddaughters, who have asked for doll blankets from me. They would love having them made from these colors. I receive Pile O Fabric's newsletter. Thanks! I love your new pattern! You are very talented! Thanks! I follow you on Bloglovin. Thanks! Thanks for the free pattern. It's a beauty! I receive the Pile O' Fabric newsletter already! I follow your blog on Blogger! Love your paper pieced block design. I already went to Craftsy and added it to my patterns! Thank you so much for sharing your hard work! I love this frozen bundle and thank you for the free pattern! I follow Pile O Fabric on Facebook and Instagram. I follow Alyssa on FB and IG. I follow your blog on Bloglovin. I already receive their newsletter. I already follow your blog with Bloglovin. I already follow them on IG. I already subscribe to the newsletter! Love those soft colors in the bundle you put together! I love the fabrics you put together! I am signed up for the Pile o' Fabric newsletter! I follow Pile o' Fabric on Facebook! I'm already subscribed to the newsletter. Thanks. Already following Pile O' Fabric on FB - thanks. I'm one of your followers on Bloglovin'. Thanks again. Love this group of fabrics - thanks for the giveaway. I follow Pile o' Fabric on instagram! 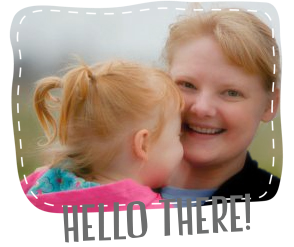 I just started following you on bloglovin. Your paper piece pattern is beautiful! Thanks for including the multiple block view... I am being tempted to take this one. And thanks for the new pattern, I love paper piecing! I subscribed to the pileofabric newsletter! I subscribe to the wonderful Pile o' Fabrics newsletter. I also follow Pile o' Fabrics on FB. Your paper-pieced block is very striking and beautiful. Thanks for sharing your pattern. I signed up to follow your newsletter. Love your new pattern! Will be downloading it ASAP! Just starting following your blog using Feedly. Hope that counts! Already subscribe to the Pile O' Fabric newsletter -- great stuff! I follow you on bloglovin'. Love your fabric choices, and I'm off to download that pattern! I really like this collection of lovely fabric! I follow your blog with bloglovn! I love your color and fabric choices! This would make some fun projects! I'm already subscribed to Pile of Fabric newsletter. This is a great combination and I love your choice of colors. I receive the Pile O' Fabric Newsletter. I love the Frozen bundle. Thanks for the chance. I am following your blog with Bloglovin. Thanks for the giveaway. I signed up for Pile O' Fabrics newsletter. I love the Frozen bundle. What great colours for a lap quilt for a little girl! I get the Pile o Fabric newsletter. Thanks! I follow your lovely blog via Bloglovin. Thanks for the paper piecing pattern! Gorgeous selection of fabrics! Thanks for the chane to win. Thanks for the fun giveaway Katie and Alyssa! This bundle has some great stashbuilders. I love the fabric with the deer. And thanks again for your inspiring blog Katie! I love the color combination of your bundle...thanks for the inspiration. I subscribe to Bloglovin and checked your blog posts....many thanks. I receive Pile o Fabric newsletter. I follow Pile O' Fabric on FB. I really love the fabric bundle you have put together - hope I win. 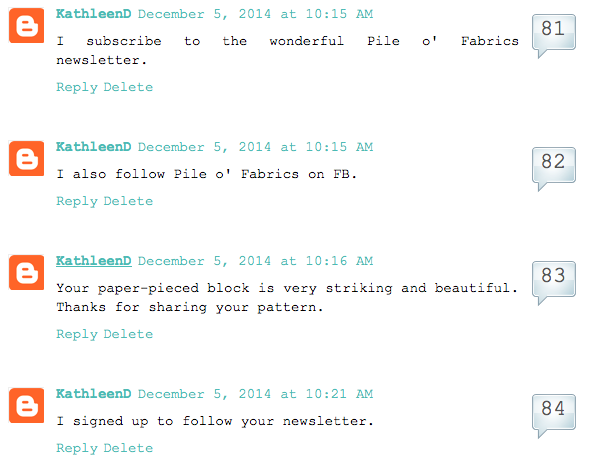 I'm signed up for the Pile o Fabric newsletter! Your star pattern is lovely and the fabric collection is absolutely gorgeous! Wish I had your eye for combining fabrics! I like your choice of fabrics for this bundle. I already subscribe to Pile of Fabric's newsletter. Thanks for the chance to win. I like Pile of Fabric on Facebook. I follow your blog via Bloglovin. I am ALWAYS in love of Alyssa's color combinations. I wish I could buy every bundle she puts together. I follow Piles O Fabric on Facebook! I love these fabric bundles "great give-a -way"
Love the star and the fabric. Nice job! I love Pile o Fabrics's collections... I get their newsletter. Nice star design. Thanks for sharing! I am one of your followers! I follow Pile of Fabrics on Instagram. I'm going to Craftsy to download your block! I already receive the newsletter. I follow Pile O Fabric on Instagram. I subscribe to the pileofabric newsletter. I love this fabric- especially the purple fabric with the floral print. I have a little girl who would love this combination of colors. Thank you! I follow Pile of Fabric on Facebook. Thank you! I did all 4- and I LOVE those bundles! Amazing colors & fabrics!! Thanks for the chance to win these!! I receive pile O Fabrics newsletter. I love the blocks and the amazing color combination. Thanks for the chance. I follow Pile O Fabric via FB. I follow you via e-mail. I follow the Pile of Fabric newsletter. Your Frozen fabric collection is lovely. Fabrics I would choose also!! I follow the Pile of Fabric on Facebook. I love comments! Thank you for taking the time to stop by and make a comment. I'm a bella lulu ink blog. Powered by Blogger.